Christchurch’s Enviro-Mark Gold accredited shopping centre The Hub, Hornby has received a $65 million facelift. 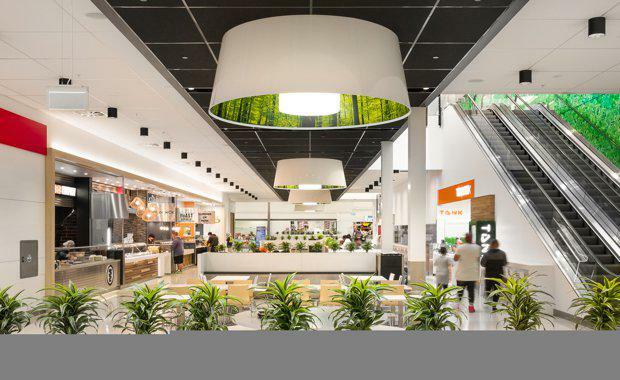 Designed by Australasian architecture firm The Buchan Group, the project involved building and designing a 6,000 square metre anchor store, 70 specialty retail stores and a contemporary food court. Transformation of The Hub begun in late 2012 after a land swap with the Christchurch City Council enabled the realignment of Chalmers Street and an increase of the centre footprint to 25,000 square metres. The Buchan Group Senior Associate Daren Alderson said delivering a design that built up to the new road boundaries, maximising the site, enabled the team to create an aesthetically pleasing exterior and highly functional interior. “We approached the road realignment as an opportunity to incorporate curved elements to the façade, creating a spectacular view for motorists entering and passing the centre,” he said. “The section facing Carmen Road and Chalmers Street now takes on a visually interesting form, leading to the substantial composite aluminum clad northern entry with two building elements linking the road to the building now clad in perforated stainless steel. “Vertical metal and perforated stainless steel cladding, graphic panels on which the Centre has elected to install Maori artworks, a black aluminum ribbon feature, and stepped parapets give the building interest in scale and form," he said. “Internally, a distinctive black ceiling recess, mirrored on the floor in terrazite and surface mounted black lights run from the main north entrance to the far side of the food court, leading the eye along the retail front. “The new continuous concourse links the existing supermarket to the new anchor store, providing room for specialty stores, a new central food court, new amenities and parents’ room, and a new pedestrian entry from the expanded vehicle parking above. “A natural palette of grey, black and white was rolled out for the entire centre to integrate the new build and modernise the existing shopping space," Mr Alderson said. 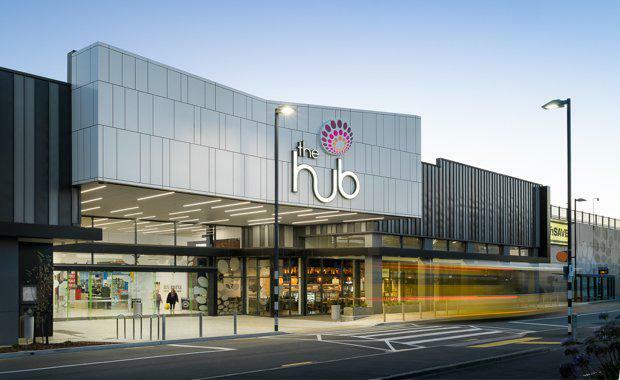 The Hub, Hornby centralises Christchurch’s southern rural and urban communities anchoring the adjacent bulky goods retail and trade supply precincts.